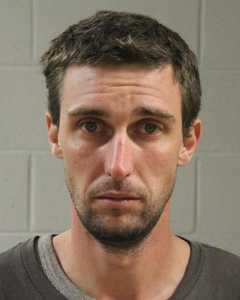 WASHINGTON CITY – Officers arrested a 29-year-old St. George man early Saturday morning who was reportedly stumbling around burglarizing vehicles. Just after 6 a.m. Saturday, officers responded to the 400 East block of Telegraph Street on a report of a suspicious person, Washington City Police Officer Trevor Edwards said in the probable cause statement supporting the arrest, where a witness reported that a man appearing to be intoxicated had gotten into his vehicle. After searching the area, officers located a man matching the description provided by the witness, standing next to another vehicle and reaching inside of it, the statement said. Officers made contact with the man, later identified as 29-year-old David Colby Brereton, who “stumbled towards” them, Edwards said in the statement. According to the probable cause statement, Brereton admitted to officers he had taken Klonopin, a schedule IV controlled substance used to treat anxiety. Officers contacted the owner of the vehicle that Brereton was getting into when they found him. The vehicle’s owner informed police the vehicle was hers, along with the property Brereton had taken from inside it, the statement said. Brereton was arrested and booked into the Washington County Purgatory Correctional Facility. He was charged with two class A misdemeanors for vehicle burglary, and one class C misdemeanor for intoxication. His bail for release pending trial stands at $4,240. This was not Brereton’s first run-in with the law. Since 2007, Brereton has been amassing a list of criminal charges in Utah, according to Utah state court records, including simple assault, vehicle burglary, drug possession and theft. Benzos, huh? I’m going to classify him as a dang junkie. I will bet his parents are dang proud!